It’s fair to say billionaire Pete Peterson’s anti-deficit lobbying group Fix the Debt got more than it bargained for when the organization recently decided to hold a Q&A session on Twitter. The fearmongering campaign was trying to sell young taxpayers of the “Twitterverse” on its agenda for cutting grandma’s and grandpa’s Social Security and Medicare. How’d it go? Not so well. 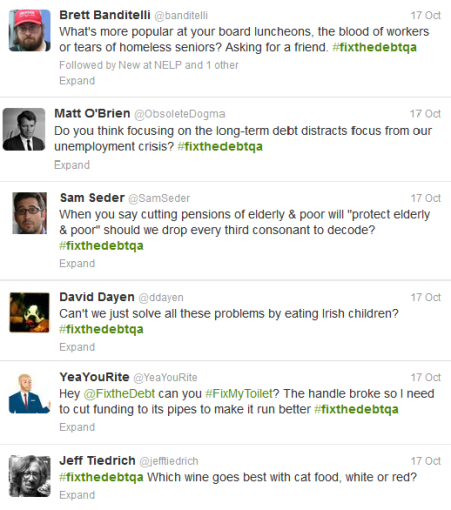 Twitterers from all over pushed back on Fix the Debt’s core message with jokes, pointed questions and snide remarks showing the organization’s foolish, generational-warmongering agenda for what it really is. Below are just a few of the best comments. For more, click here.